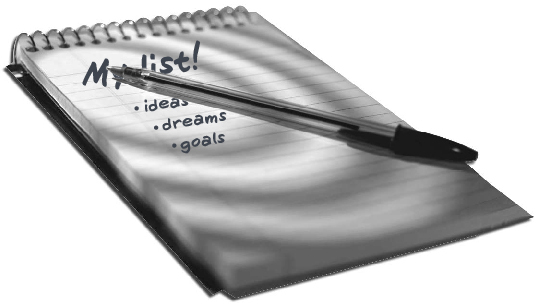 Top 5 – Reasons For Writing Down All Your Ideas, Dreams and Goals. Applying this technique in your life has many benefits in helping you achieve all of your desired dreams and goals. Here are our Top 5 reason’s for writing down your Ideas, Dreams and Goals. 1 – It will provide you with more head-space and clearance. Taking the time to write down all of your desired aims and objectives will clear your head and help you to discover exactly what it is that you want to achieve. 2 – It will help you to determine a timescale. Everyone has plans and objectives that they aim to achieve over a certain period of time. Writing down your goals can help you to set out a more specific time scale for each target. 3 – It will motivate you to complete each task. Having all your ideas and goals down in writing gives you something that you can always refer back to at any time. Your ideas, dreams and goals will never be forgotten!!! 4 – You can evaluate your progress. You can set personal deadlines for all your goals, and every so often set a date so that you can refer back to your list. This will help you see what tasks you have completed and what you still have to do. 5 – You can reward yourself. When you feel you have fully achieved a specific goal, reward yourself! You have set out and completed your desired goal. This will give you a real sense of achievement and build confidence.